X Terrace and London Hat Week present: "The Great Hat Exhibition 2018"
The name of 2018 London Hat Week official exhibition came from the historical event that took place in London in 1851. The Great Exhibition of the Works of Industry of All Nations or ‘The Great Exhibition’ was the first in a series of World’s Fairs, exhibitions of culture and industry that became popular in the 19th century, and it was a much anticipated event. 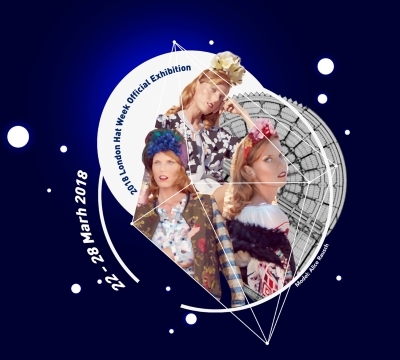 Following the successful 21st Century Hat Exhibition in 2015 and Milliner x Artisan exhibition in 2016, we celebrate world culture heritage in magnificent hat designs at The Great Hat Exhibition from March 22-28, 2018. We have invited milliners from all over the world to showcase their beautiful creations inspired by a piece of history or culture, or crafted with unique technique or craftsmanship of their nation.The exhibition will be held at The St. Pancras and Somers Town Living Centre, 5 mins walk from King's Cross station. We will showcase 200+ beautiful hat designs inspired by a piece of history or culture, or crafted with a unique technique or craftsmanship of their nation, by milliners from all over the world! There will also be a pop-up shop with over 100 hats for you to choose from during the exhibition period! See you there!! Tickets are valid for entry on any day of the exhibition, but may only be used once. You do not need a ticket to come into the shop.